The Idaho Transportation Department has indefinitely suspended completion of a 27-mile state Highway 75 expansion project in Blaine County because of an anticipated loss of future federal funding. The 27-mile highway expansion plan is divided into nine separate projects. ITD has funding and plans to complete two of those projects and part of a third, but the department anticipates that after that, work will come to a standstill. "The project's not dead, it's just in a waiting cycle," ITD spokesman Nathan Jerke said. "The need's not dead, and we plan to get back to it someday, but when that someday is, is the big question mark." ITD is bracing statewide for a federal funding cut of about 30 percent, possibly as early as the beginning of fiscal 2012, which starts in October. Revenues from federal fuel taxes are declining and a new transportation bill being hashed out in Congress could lead to massive cuts in highway and other transportation funding. "It's still in the forecasting state, but that's kind of what is going around the office," Jerke said. The Idaho Legislature approved a $738.6 million budget for ITD for fiscal 2012, anticipating $306.9 million in federal funding, most of which is used for highway construction. A 30 percent cut would translate into a revenue loss of just over $92 million. With the exception of the work already funded for the Blaine County Highway 75 expansion project, ITD Region 4, which includes the Wood River and Magic valleys, has no plans for new highway expansion work. Instead, Jerke said, ITD plans to spend any available funds on repairing the existing highway infrastructure. "Just trying to keep the roads and bridges we have intact and in a safe condition is the primary goal right now," Jerke said. He pointed out that resurfacing work going on this summer at several Highway 75 locations in Blaine County is an example of ITD's effort to keep the existing infrastructure intact. The highway expansion project in Blaine County has been in the planning stages for more than a decade. 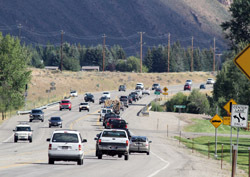 It would involve widening and other improvements along a 27-mile stretch of the highway from Timmerman Junction south of Bellevue to Saddle Road in north Ketchum. The total cost was estimated at $250 million, but ITD has only $29 million for the project. Of that $29 million, $27 million is federal funding and the remaining $2 million is from state matching funds. An environmental impact statement completed in 2008 divided the expansion project into nine separate projects. In consultation with local officials, ITD decided that the first project would be widening and other improvements to the 3.25-mile stretch of highway between Timber Way north of East Fork Road and the Big Wood River bridge near St. Luke's Wood River Medical Center. Of the $29 million in hand, $19 million is dedicated to completing what is often referred to as the "Timber Way project." ITD Project Manager Mike Scott said the department is in the process of right-of-way acquisition for that project and is now finalizing construction design. Actual construction is projected to begin in spring 2013. The other $10 million in hand is being spent on a "wetlands mitigation" project north of Ketchum and on the design of a project that would replace the Big Wood River bridge near St. Luke's and widen the highway for about a half mile north to Elkhorn Road. Scott said construction on the wetlands mitigation project is expected to begin in 2015. It involves relocating a 1.5 mile section of Highway 75 near Phantom Hill north of Ketchum to restore wetlands that were damaged when the highway was built through them in the 1960s. Wetland mitigation is required under the federal Clean Water Act to replace wetlands that would be disturbed along the 27-mile stretch of the highway expansion project. Scott noted that the Big Wood River bridge replacement near St. Luke's is only funded for design and not construction. He said that when the Timber Way project is underway, striping on the existing bridge will be changed to accommodate three lanes of traffic to help avoid bottlenecks because of the new four-lane roadway.